Hey guys! If you don't follow me on Twitter or Instagram (links to the right!) then you don't know about the plague on my house for the past month! I've been battling bronchitis (constant coughing....constant) and my littlest was really sick with a sinus infection and then a virus that had him (and me) benched for a week :( Even though we weren't all better we traveled over Thanksgiving and then as soon as we got back another kid and Mr. Aggies got sick, and my cough got worse! I've been to a doctor's office more times in the past 4 weeks than I care to mention. bleh! We all seem to be getting back in the swing of things, we are all ready to be healthy again! I've had this collection for a few weeks but it has just been impossible for me to get to them until this week-which I HATE and have been really feeling terrible about. But now here they are yay! I do have a couple comparisons and I was going to include them here but there's so many pictures already I will be putting them in the next post. 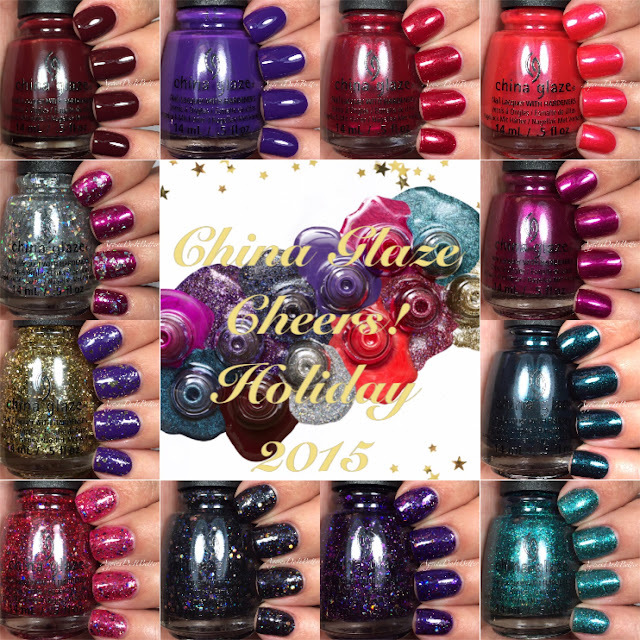 If you're looking to do any holiday polish shopping checkout my StoreEnvy Page! Link to the right! Let's get into it! 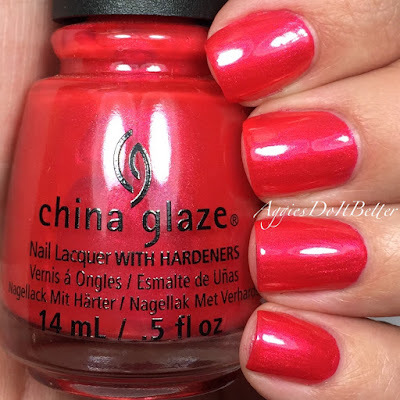 The China Glaze Cheers! collection has a good mix of crèmes, shimmers, and glitters, it's very festive. 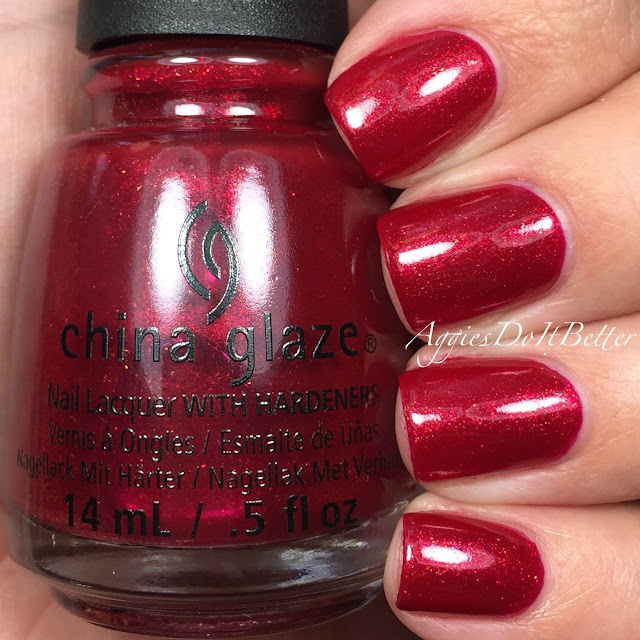 China Glaze always has great holiday polishes and they are known for their holiday glitters! Mix and Mingle is a purple crème. The formula was a little thin, I felt like it needed 3 coats to even out. It photographs a taaaaddd darker than it really is. 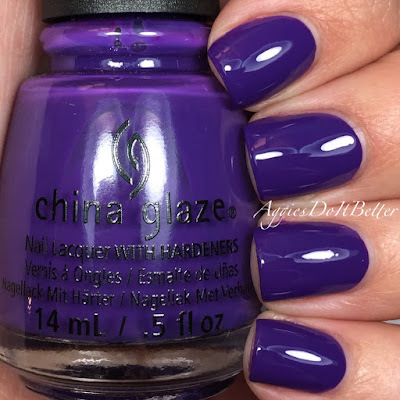 This is a great color though, and a staple in anyone's collection. 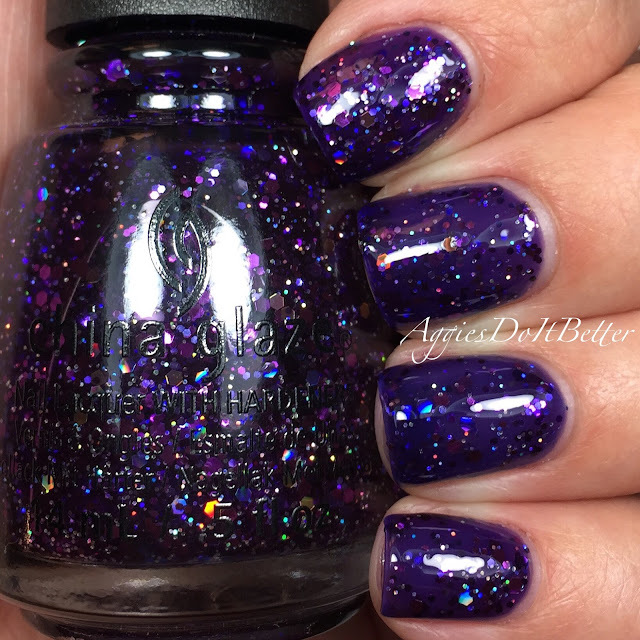 If you don't have a purple already you need to grab this one! Wine Down for What? 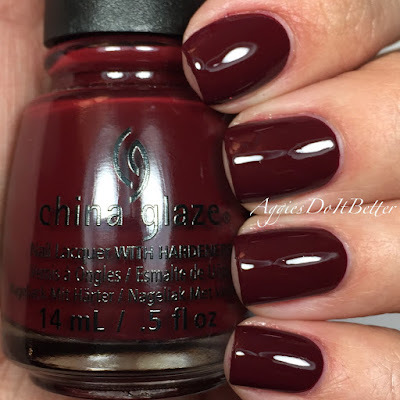 is a burgundy red crème....in other words MAROON. Yippee! I don't have any maroons from China Glaze! 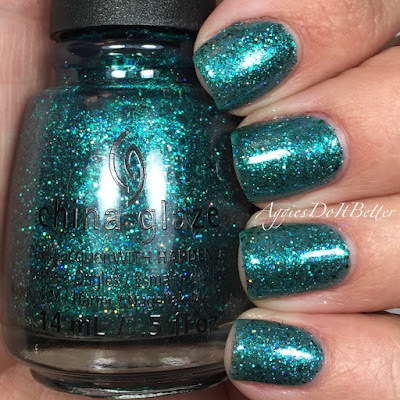 This one had the honor of being chosen to swatch last so I could wear it...the name is hilarious and this color is everything. Also? this is >this close< to being a one coater! I used 2 here for the swatch. Son of a Nutcracker (giggle!) is an orangy red shimmer. Really pretty, 2 coats here, not my bag when it comes to colors but I would wear it on my toes in the summer! But seriously, the name. Does anyone NOT love the movie Elf?!? Better not Pout is a deep raspberry colored shimmer. I had a little trouble with the formula, it's a little thin so you have to be careful not to get too much on the brush. The end result is gorgeous-I love this shade of pink/purples. Peppermint to Be is a cranberry red shimmer. This is 2 coats. This is Christmas in a bottle, haha! No problems with formula. I will be using this lots! Don't Get Elf'd Up (giggle again!) is a dark green/black shimmer. Look familiar? This is one I have a comparison coming up for! 2 coats, no issues. My nails are short right now so I'm digging darker polishes. I Soiree I Didn't Do It (long name!) is a green microglitter in a light green jelly base. This seems like it would build up like other jelly glitters but it doesn't really. This is 4 coats, yes FOUR, and then I stopped. It would be better suited over a green base (or black!) and it will be awesome! Bring on the Bubbly is a gold glitter topper. 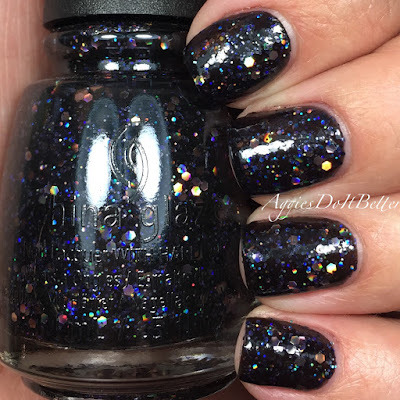 I felt like the glitter payoff was excellent, this is one brushed on coat (with a little dabbing to move the glitter around) over Mix and Mingle. I'm really hooked on my matte topcoat right now (I use OPI matte) and felt like seeing how it would look.....yep. Love it. Break the Ice is a silver/holo shard glitter topper. Something really different from China Glaze! 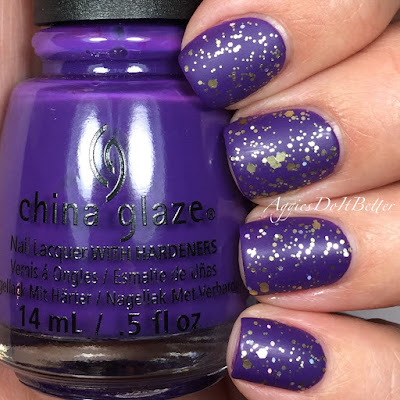 (clapping hands) the glitter coverage on my nails is different on purpose, I wanted to show different levels from different methods. 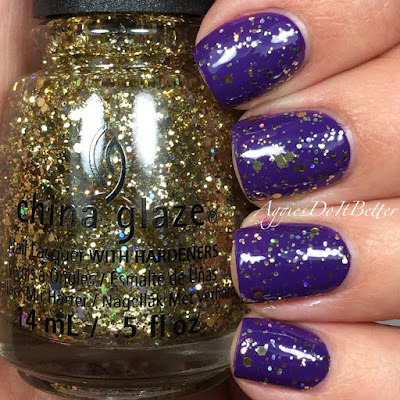 1st finger is 2 brushed on coats, 2nd finger is one brushed on coat, 3rd and 4th fingers are sponged on glitter, which is necessary because this glitter isn't as dense as the gold one. 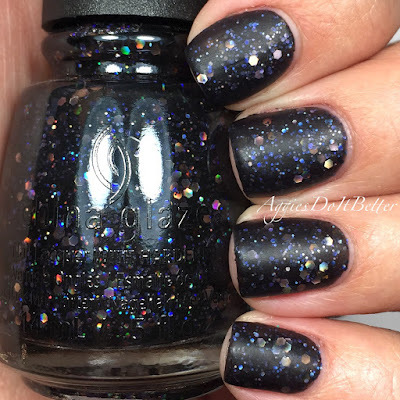 Coal Hands, Warm Heart is a black jelly with multi colored glitter. 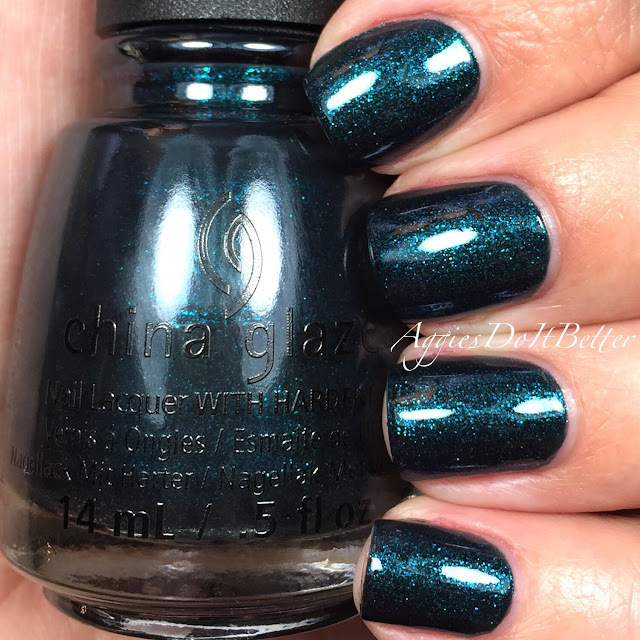 In my press release China Glaze calls this midnight blue, but it sure feels black to me. This is 2 coats, the formula is a little tricky, thick but runny at the same time. Have some patience with it and it will be worth it! You definitely need topcoat with these (shown). And then I matted it. yep. 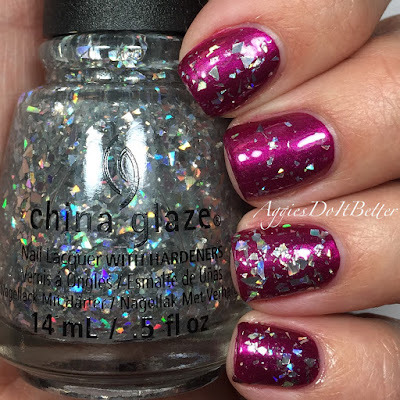 ﻿Ugly Sweater Party is a pinkish red jelly with multicolored glitter. This needed 3 coats and topcoat. This might do well with a similar colored base polish to cover any visible nail line.